A.D Practique design and build Garages, Garages with Studios and Carports Freestanding or Attached. 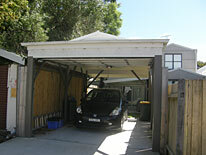 Adding Design Practique create Carport Designs in Sydney, Garage Designs in Sydney and Garages with studios in Sydney. 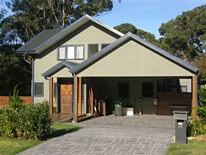 We build our Garage, carport and studio designs anywhere in the Sydney basin. A well-designed carport like a garage is a great investment. If it is open-ended or if it has a remote-controlled door it is usually easy to get in and out of and provides a protective area for a valuable investment. Nowadays, clients realise that a carport when well designed can be a valuable asset. Carports can be designed with pitched or skillion roofs, panel lift door or roller doors and they add real value to the home. The same internal measurements, recommended by the Australian Standards, that applies to a garage applies to a carports. If the new carport is alongside of the house it is preferable to have at least 3.0m of width. A carport can be designed in a narrower space but anything between 2.50m and 3.0m is going to tight and anything less than 2.50m is not recommended. In my experience a well-designed carport close to the house will get far more use than a large garage that is often built a fair distance from the house. However, both have their uses and often a combination of the two is the preferred option. If your property has limited space. Many inner city properties have limited garden space and yet parking on the street is an impossibility. With good design you can create a carport can be used as a an outdoor entertaining area and a storage space for your car. Garages add real value to a house and are a great investment. Garages are now multi-function storage and work facilities. The simplest design that complies with the recommended Australian Standard is with a 5.5m internal depth and 3.0m wide internally This will be a simple structure suitable for storing a car. Many clients are looking for a two car garage. 6m x 6m is a comfortable space for two cars. The minimum recommended height with a panel lift door is 2.7m to the top of the top plate. These measurements are all minimums. I prefer a higher ceiling height. Many clients I speak to want storage and workshop facilities. If it is possible to increase the roof height, the most effective storage is in the roof cavity accessible with a pull-down ladder. A good roof cavity storage area well designed and built will store scores of storage boxes, tents, suitcases, and small furniture, basically anything that will go up a pull-down ladder. For the storage space to be effective you need the correct roof design. In most cases your land area will dictate what is achievable. Many clients want a two-car garage with additional storage in front of the parking area for the car. The depth is usually decided by what space is available and what is required to be stored and the internal width would need to be at least 6.0m. Many two car garages are designed with the second car space used for a bench and for bicycle storage. We have also designed storage areas separated from the garage by an internal wall. These areas are suitable for storing lawnmowers, whipper snipers, gardening equipment and with enough space for a work bench and wall shelving for paint tins and household maintenance equipment. This needs to be a respectable size if everything is going to fit and you still have enough room to manoeuvre. Another popular option is to create an office space attached to the garage. This is often a popular choice for the homemaker who wishes to run or continue a small business or for a home office for a professional. Another common request is for the combined garage and granny flat. We have designed a number of these where the granny flat is located behind the garage. 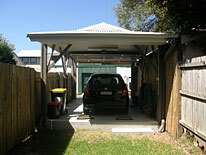 Garages with attached Carports are often a considered option for the clients who wish to use their garages for storage. Studios tend to be smaller than granny flats usually about thirty to forty square metres. They are also defined differently by planning departments. If you wish to transform a garage to a studio You will have to comply with both planning and certification requirements. We have designed and built both first floor studios over a garage and ground floor free standing studios. The first-floor studios can offer some planning challenges particularly if the neighbours or councils are obstructive. As with all design work just because the neighbour doesn’t like your ideas doesn’t necessarily mean the councils will block the development. Most council’s in Sydney realize that people wish to maximise their space and with the recent changes to NSW planning laws it is easier to get planning approval. Studios can be simple work spaces or you can include a bathroom. Whether you can legally add a small kitchen to a studio will depend on the councils interpretation of their LEP. A well-designed studio can be used as accommodation or as a workspace. We have recently designed a number of garages with studios above. These are very popular in the inner-city suburbs where space is at a premium. Obviously, they could be just as effective in a rural setting or in suburbs that have larger land sizes. They have been used as home offices, accommodation for older children or accommodation for aging relatives. In all cases, they are designed with a bathroom and a small kitchen. On larger land areas, they can be submitted as either a detached dual occupancy or as an attached or detached granny flat. On blocks, less than 450m2 they would be submitted as an alteration and addition. In some cases, they can be built as a complying development. Whether your proposal complies will need to be assessed. If your land area is less than 200m2 it is unlikely that it will comply. Anything greater and the proposal will depend on the Local Environmental Controls of the particular council area. If you wish to establish whether a proposal is complying email %D6%BA%A2%CE%A1%C0%AE%B8%C5%B2%B2%96%AD%97%E4%BB%DF%E9%9A%A0%BA%D7%D7g%B9%CF. Step 1 Contact After the first contact we examine your property on Google Earth and examine the particular council area requirements that exist. We will inform you over the phone of the suitability of your project. Step 2 On Site meeting We meet the clients on site to discuss budget, and design possibilities. We will email you a written quote to prepare some design options. Step 3 The Design Process If you proceed we prepare sketches showing you the floor plan layout and elevations of your project. We advise about the choice of building materials and the different costs associated with each choice. Step 4 Building Quote A building quote is generally not provided until after the DA has been determined. Initially a broad estimate can be offered but council interpretations of stormwater and sewerage need to be taken into account. Additional costs can include new driveways and street laybacks. If you require a detailed building quote before the commencement of the design process one can be arranged for a fee. Please note there will be at least three days work time needed to prepare a formal quote. Any fees paid are not refundable. Step 5 Contract The first stage of any proposal is the design and documentation process. The initial contract is to design and document the project. Once the project has received council approval a building contract will be prepared. Step 6 Council Approval Once you have received council approval you will need to engage a private certifier. 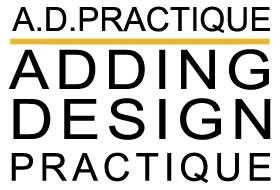 The certifier will require will receive a list of items to complete the construction certificate. The information he will require will be structural and hydraulic drawings a specification and a home warranty insurance certificate from your nominated builder. Step 7 Building Begins The construction time will vary from job to job. It will depend on the complexity of the site and the size of the project.